Henry Picker and Heinrich Heim were the two scribes who took down what Hitler said at his mealtime conversations. Hermann Rauschning wrote a book called Conversations with Hitler (also: Hitler Speaks). Problem: How can we assess their reliability? How Reliable is Henry Picker? NO one will go to bat for -- although one or two of us would have enjoyed taking a bat to -- the Hermann Rauschning baggage [Gespräche mit Hitler], who should by now have been driven out of the game per saecula saeculorum; but, of course, he is still too useful to certain parties so he is to be stored in the broom closet: they won't give him the sack outright. I well remember back in the late 1960s, when my 16 year old sister performed a devastating feat of philological criticism when she proved to her imbecile High School history teacher -- who ranked Hitler Speaks with such "existentialist" and gratefully forgotten bilge of yesteryear as Albert Camus and Jean Paul Sartre -- that huge hunks of "Hitler's" dialogue were hoisted ne varietur out of Guy de Maupassant's shattering later works, those horror contes that were written when the spirochaetes were delving into his little gray cells and madness was right around the bend ("The Horla," "Diary of a Madman," etc. ); while other bits were plundered from "unknown" author Fyodor Dostoyevsky, and some moodily Gothic hunks of mise en scene were hammered together out of bits and pieces left from Zarathustra' first Paris Opera run. Yes, high marks all round to the professoriate! But as Huysmans once said, "The sea of human stupidity is forever at high tide," and so recently I learned that an author had indulged, in a poor and pallid piece of hackwork on Adolf Hitler for the Sunday supplement of the Sunday Pail of Swill, in the goofiest bit of circular reasoning that I had encountered in donkey's years. He blandly stated that even though Rauschning may not have been an intimate with Hitler, the work in question may still prove to be a viable documentary source, because it still "rings true" as resonating with what we "intuitively recognize as Hitler's own voice." Yeah, after we have allowed Rauschning, Maupassant, Dostoyevsky, and -- who knows! -- Bela Lugosi and Boris Karloff, to drill that melodramatic blather into our heads for 60 years! However, I do believe that at least some small degree of caution may be in order when dealing with the documentary records provided by Herr Henry Picker, for at least one reputable authority holds that Picker may not have been all that he should be. Heinrich Haertle seems to have thought that Picker can be positioned more along the lines of what the late Mark Twain referred to as a provider of "stretchers" (third or fourth cousins of the truth) rather than the more creative and culpable outright liar of the Münchhausen or Rauschning or Speer species. Still, counsel may well want to check out what Heinrich Haertle has to say. In Herr Haertle's edition of Alfred Rosenberg's post-war memoirs, entitled (by the editor) Grossdeutschland Traum und Tragödie: Rosenbergs Kritik am Hitlerismus (and in spite of the usual Fleet-Street sneering, these memoirs are precisely that, a "critique," which, when conjoined with Rosenberg's principled refusal to join the winning team, as it were, once all had been made clear to him, certainly makes the post-war cynicism at his tenacious stand at Nuremberg tell us a bit more about the rancid souls of our hollow men at the daily rags than we may have wanted to know. It certainly casts a more noble radiance upon Rosenberg (left): a man who kept his nerve, his pride, and his principles intact and entire after his downfall. Strange, is it not, how so many commentators almost come right out and say something that no 19th century historian would have dreamed of saying under any circumstances; I'm paraphrasing, of course: come on, don't be an idiot, get real, make a deal and say what they want you to say. Everybody's doing it! I do believe that the only way to retaliate against such an offense is in kind, say, with a glitzy pamphlet featuring Hauskeller, with the intervention of some space-age quilt-quotations and a few nifty graphics, endorsements from Joe McCarthy and Jeff Dahmer, and several snaps of the guy with three or four underage zebras, as he gets all smarmy and sentimental confessing that nothing is more fun than a spot of NS genocide on the weekend -- and then he winks and winks again -- fade-to-black with Current 93 soundtrack. HENRY Picker took over the duties of writing the notes on Hitlers conversations from Heinrich Heim, Martin Bormann's adjutant, in 1942. I interviewed Heim in the 1960s. He told me that Picker had found a sheaf of his notes in the desk when he took over, and after the war rewrote them in the third person and published them as his own work. Picker, a wealthy landowner after the war, established a priate Hitler museum stuffed with priceless Hitleriana, for example he purchased all of Julius Schaub's personal effects. Far more significant than Picker's are the original Heim Aufzeichnungen, of which one (October 25, 1941) is illustrated here. 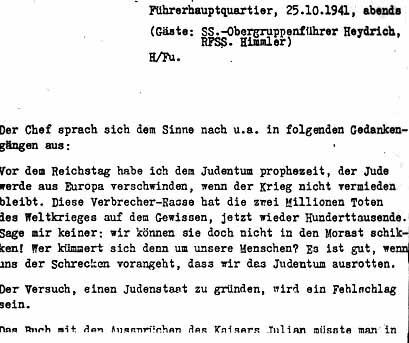 Heim ("H/") wrote them in the first person, in direct speech, and Bormann personally signed each day's notes as accurate. The several ring binders of the notes were purchased from the Bormann family, along with Bormann's own correspondence with his wife, by Swiss banker François Genoud after the war. Austrian-born publisher George Weidenfeld published an English translation as Hitler's Table Talk, with an introduction by Hugh Trevor-Roper -- the book is still in my view one of the best windows into the mind of Hitler himself. Weidenfeld had purchased rights from Genoud (as the latter told me) for forty thousand pounds. Genoud insisted that half the payment be made direct to Hitler's sister Paula! Weidenfeld choked, but did as he was bidden (Weidenfeld later denied this story). Genoud allowed me privileged access to the original German documents for Hitler's War. Other scholars like Martin Broszat and Charles Syndour were unfamiliar with the German texts, and jealously accused me of misquoting when I produced my own translations of the notes, but that is another story. Finally, the table-talk notes written by Dr Werner Koeppen (Rosenberg's adjutant) should not be overlooked. I donated a transcript to the Institut für Zeitgeschichte many years ago.